This consultation is about gathering views from the public on revised proposals to improve the environment for cycling and pedestrians along the ‘Quietways’ route in the Ham area. Quietways are a network of cycle routes throughout London aimed at overcoming barriers to cycling. One Quietway in London has been launched and up to seven more are expected to be launched in early 2018. They utilise low traffic routes within parks and back streets whilst also seeking to provide improved access and safety where they pass along busier roads and through local centres. Why is Teddington not included in this consultation? In the original consultation (in 2016), it was proposed to include a Quietway through Teddington High Street. However, following a review of the route, comments received and a review of funding, it has been decided not to continue with this stretch of road as part of the Quietway scheme. The Council plans to re-consider improvements to Teddington High Street that will benefit cyclists and other road users, subject to full consultation and engagement with the community, and future funding. 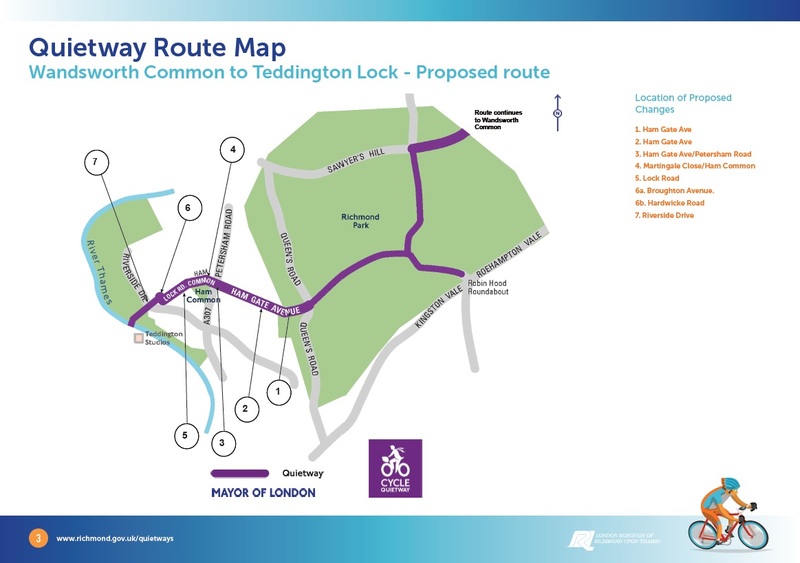 Therefore, the Quietway scheme will only now consider Ham Gate towards the Teddington Lock Footbridge. Why are changes being proposed for this area? The Council is committed to making Richmond upon Thames roads safer for everyone living in, working in and visiting the borough. Creating an environment that will encourage more walking and cycling is a key part of the Council’s transport vision and an essential part of Richmond’s transport strategy (Local Implementation Plan) and successive Mayors’ Transport Strategies. In Spring 2013 the Mayor of London published the Cycling Vision for London – a 10 year strategy with approximately £1bn investment to increase the levels of cycling in London. One of the primary objectives of the strategy is to create a “tube network for the bike” containing a mixture of Superhighway and Quietway routes. Quietways are well signed, connected cycle routes that provide an attractive and accessible environment for cyclists often on low traffic roads. One of the key objectives of the Quietways is to link destinations, often following backstreet routes, through parks, along waterways or tree-lined streets. You can have your say on the proposals by reading the consultation document here and completing the online survey below or by attending the exhibition on Wednesday 7 February from 3pm - 8pm at Ham Library Annexe. The Council will incorporate any amendments into the final plans before expected implementation, which could start in March 2018 in Ham.